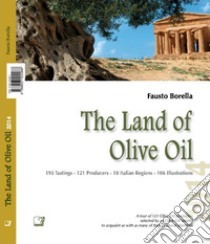 195 Tastings - 121 Producers - 18 Italian Regions - 106 Illustrations - - - A tour of 121 Olive Oil producers selected by an Olive Oil Masterto acquaint us with as many of Italy's cultural identies. - - - Fausto Borella a native of Lucca, he studied under Luigi Veronelli, is a dynamic Communicator of the value of extra-virgin olive oil, and is a food and wine gourmet with a solid background. In addition to being a Wine Master and Oil Master, the Food and Wine journalism industry and National institutions also took notice of him for his passion and high level of professionalism expressed in his ability to divulge this celebrated product of Italian gastronomic identity.